This classic collection was written over 70 years ago, yet it is a surprisingly modern recasting of the traditional tale with a strong female character who uses her intelligence to outwit the less sharp wolf. Despite many hairy encounters with the hungry wolf, there are no quivering females here and granny, too, is made of sterner stuff than might be expected. Timeless. Talk together about the most interesting parts of the story and why you thought so. 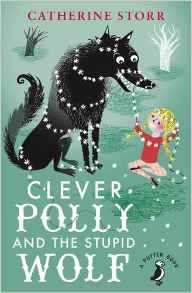 Can you remember the different ways Polly manages to escape the wolf? Have you ever overcome your fear of something? Say what happened and how you felt. What was your favourite story and why? Children can write their own traditional or modern story about tricking the wolf using words and pictures.